A barnacle goose (Branta leucopsis), which is supposed to be in Greenland, is swimming in a crowd of Canada geese in Prospect Park’s lake, trying to blend in like it’s no big thing. The barnacle goose is much smaller and flashier than the Canada geese. You don’t have to be a good expert to notice the difference. The Barnacle Goose migrates among many countries in northern Europe, with its biggest territory in Greenland and lots of little outposts in the UK, Russia and on cold islands you’ve never heard off, stretching all the way to Russia, according to a map from the IUCN Red List. Peter, who runs Brooklyn Bird Club, noted in an email to a yahoo group that it’s probably the first ever seen in Prospect Park. But people have posted sightings on ebird as far south as NC. Out on Montauk, people had a rash of sightings of a solitary Barnacle in 2006 and 2007. In 2010 one showed up at the other end of New York City, in Pelham Bay Park. 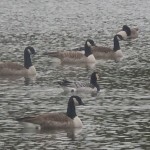 So, it’s not the first Barnacle Goose to end up on the wrong side of the Atlantic, but it’s still a pretty big deal. Here’s a much better picture.